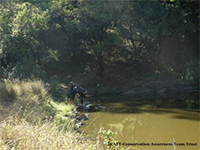 The litter clearing drive is one of the many activities that is envisaged by CATT in helping to conserve wildlife. As of today, our forests and the area surrounding it are defaced by the litter and garbage left behind by the tourists and pilgrims. The amount of detritus that is strewn around, prove to be detrimental to the fragile ecosystem. Each acre of the forest land is covered by thousands if not millions of bits of plastic which could be effectively recycled. 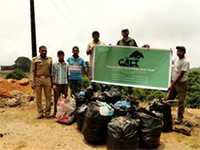 The CATT members regularly organize litter clearing drives where our volunteers cover long stretches of forest land along roads clearing litter and lend a helping hand to the forest department to maintain the serenity in our pristine patches of forests. Our goal is to have litter free forests. In the past six months, CATT has rid several square kilometers of forest land around various ranges of Bandipur National Park and Talacauvery Wildlife Sanctuary, and what CATT has achieved is quite a feat. 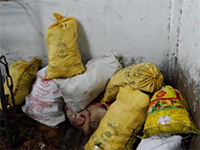 70-80 kilograms of plastic and other non-biodegradable litter was collected from inside and the surrounding vicinity of the Bandipur Tiger Reserve in a project spanning over 4 days. It was during the annual festival at Gopalaswamy Betta range when a huge littering happens by the visiting pilgrims. This year over 3000 people had converged. After the festival, CATT along with another NGO named TPS and forest staffs sanitized the entire stretch by collecting and disposing of all unwanted and non-biodegradable wastes. Talacauvery temple is situated at the entrance of the Talacauvery Wildlife Sanctuary. This place gets littered very badly. Around 20% of the total was cleared by CATT volunteers along with the forest guards in an effort to rid the sanctuary of any biodegradable/non-biodegradable material. 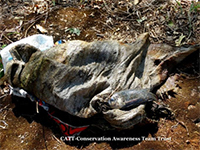 CATT volunteers along with few forest staffs walked around 7 kms to clear litters around the NH in the Bandipur Tiger Reserve. These litters are generally dropped by the visitors and tourists passing by the park. Around 13 bags of litters were collected. 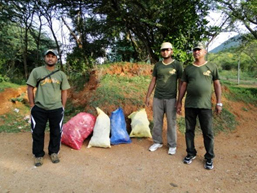 5 Bags of litter and several other no-biodegradables were collected from the Gopalaswamy Betta Range of the Bandipur National Park for disposal on a weekend. Again these are the dumps by pilgrims, tourists and other visitors. The forest guards and watchers are the guardians of the jungle who risk their lives every day to protect our paradise, our biodiversity, our wilderness and much more than that. The least we can do is - lend a helping hand. 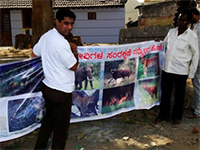 CATT as an NGO believes in supporting the front line staff & their families who are the backbone of wildlife conservation in Karnataka and across the country. CATT in collaboration with Hosmat Hospital arranges Free Orthopedic Medical Camps to treat several orthopedic issues regarding the forest department staffs who undertake long patrols into the jungle along treacherous terrains amidst unpredictable weather. This is one of the ways to show our support to these brave hearts. As of now CATT has organized three medical camps at various Ranges of the Bandipur Tiger Reserve. These camps were attended by more than 300 people ranging from forest guards, watchers, their families and villagers from remote tribal colonies including contract & regular employees of Forest Department who generally refrain from basic medical attention. CATT vouches to organize many more such Medical Camps in future too. Serious cases are referred to hospitals. Advised on how to prevent them. Taught basic exercises for muscle and bone strengthening. Followed up through the volunteers. We at CATT, follow community inclusive strategies where the people spearhead conservation and play an important role in supporting the forest department to bring about preservation. This is achieved by periodic interactions with villagers and other circles which are arranged by our team to educate people on the importance of people led movements while allowing them to cherish the biodiversity. CATT also organizes awareness drives in schools (in cities as well as villages in the forest), corporate circles and our local society. 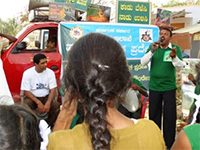 In collaboration with WCF (one of leading NGOs in Bandipur national) CATT carried out a Forest Fire Awareness campaign, during the summer of 2014. This campaign was carried out at the schools and colleges in the villages situated at the edges of the Bandipur Tiger Reserve. We visited four schools and two colleges distributing the pamphlets and spreading the words of forest fire, its negative impacts and how to stop it. We were also present at the street play conducted by WCF in one of the villages of Bandipur Tiger Reserve. The intent of the street play was the role that each and every villager plays in preserving our heritage forests. They were educated about forest fires - on how to prevent one and how to mitigate if one occurred. We believe that such plays are more effective in reaching out to the masses while trying to educate them on human-animal conflicts and how we can reduce them collectively. CATT also believes in the importance of imparting conservation ideas among the youth for which, it includes programs and drives in Schools to ignite the passion among young minds and encourage them while making them realize the value of our forests and the role they could play in protecting it. Recently, one such drive was held at JSS Public School where, the students dealt with issues and concerns through an interactive session with the CATT members. The Vibha Dream Run, witnessed CATT members pushing through various needs of the forests among the corporate circles and the great deal of help it could get from them. The activity involved, volunteers reaching out to a number of people to harness the support required and to impart the same values which fuels us when it comes to conservation. The annual rath yatra of the Venugopalaswamy temple (located atop the Gopalaswamy Betta) witnesses 25 - 30 thousand people thronging the temple located in Bandipur. As this festival occurs during peak summer time, there are high possibilities of forest fires resulting from human activities. 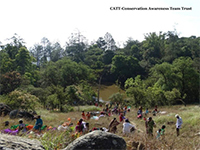 To prevent such untoward incidents and to reduce disturbance in the core area, the members of CATT were stationed at strategic locations to prevent people from entering the reserved forests and to manage the crowd. Quick response from volunteers and KFD curbed movements of devotees outside the temple area and into the protected reserve. The efforts of KFD, KSP and several other NGOs resulted in no untoward incidents in Gopalaswamy Betta and in the protected forests. During the festival, the pilgrims bathed, brushed, washed their clothes and literally made a mess of a very crucial water-hole deep inside the park and the area surrounding it. After the festival, CATT sanitized the entire stretch by collecting and disposing of all unwanted and non-biodegradable wastes. There were 2 major forest fires during this period where CATT volunteers helped the forest department by doing fire-line monitoring and acting as fire-watchers to look out for fires. Dead fish, after it got caught in a gunny sack left behind by pilgrims at a water-hole inside the forest, during the religious festival. This was discovered when CATT- Volunteers were clearing the water-hole of all such litter. A fire line is created during summer season as Bandipur being Dry Deciduous type forest is very vulnerable to forest fire. Members of CATT Team has been created summer line this season along with forest department staff to stop forest fire from crossing over from one part of forest to another specially ground fire. It is a safe controlled burning & doesn’t have harmful effect on the eco system or vegetation. Controlled burning of grass as to create fire line also helps to generate fresh grass later during monsoon for herbivores to graze. During early summer we create Fire Lines across Bandipur TR & then comes time to monitor these fire lines along the Elephant proof trenches. CATT Members have regularly monitored Fire lines along the EPTs because there is a high possibility of fire during summer season. Elephant proof trenches are created in the buffer areas at the border of the forest. Due to close proximity to village area and animals moving out of forest to eat crops villagers generally annoyed with wild animals. Summers is the perfect season to take revenge so we try to monitor and find out if any villagers are trying to put fire in the forest because once it is put it will have devastating effect. It is not an easy job members require to walk 15 kms daily in scorching heat to reach forest boundary & monitor the border from the point for rest of the day. In India, we have remaining 78.29 million hectares of forest land covering over 20% of the total land as per The India State of Forest Report 2011 and nearly 800 sq. km less than the 78.37 million hectares published in the 2009 report. As per FSI the forest cover is reducing at an alarming rate. Forest fire is one of the causes. The myth behind forest fire is that, it occurs naturally by two trees getting rubbed heavily due to storm. But the fact is, forest fires occur during the peak summer (not in monsoon) and it occurs only at the edges of the forests where there is large number of human settlements, villages or small hamlets are situated. The villagers (at the forest edges) often get inside the animal territories for collecting firewood or any other forest produce and cattle grazing. Animals get disturbed severely and they attack human being or their cattle. Agricultural land at the forest edges attracts wild animals. It results in loss of crop. In retaliation, the agitated villagers set the forest in fire. It has been proved that these forest fires are not natural and merely human driven. The wildfire which had started on 13/03/2014, in Bandipur National Park, turned over 1000 acres of these beautiful forests into ashes. The type of fire which had engulfed these forests was "crown" fire which spread from tree-top to tree-tops. In spite of our best efforts, CATT Team could only reach the scene of this tragedy on the next day, but we continued to provide support to Forest Department to put out the fire. We have not heard of or seen any large-animal deaths due to the Inferno. The assiduous work of the forest department has made the forest reserves in Karnataka to be one of the best protected reserves in the country and the home to one of the largest population of tigers. This is achieved by the hard work. The trained forest guards and watchers patrol the rough terrain of dense forests by foot to remove snares, confiscate illegal timber, dismantle poachers' camps, halt illegal land encroachment and rescue captured wildlife. They also patrol various beats by jeep to guard the forest day and night. Foot patrolling is a basic and important activity that is carried out regularly by the forest guards and watchers who often find it difficult to cover the entire range in terms of certain aspects. CATT joins the team of forest staff to carry out menial foot patrols in the jungle. CATT assisted the forest department of Bandipur National Park in foot patrolling for tracking an elephant which had strayed out of Bhadra and required immediate action to prevent any animal-human conflict. Unfortunately, the radio collar being used malfunctioned and the forest department had to resort to manual searching. CATT members along with two forest guards patrolled for almost 15 kilometers in search for the elephant. A weekend when most of us take some time off to relax and drive down to the nearest mall, there were some who had something better.... A group of enthusiasts with visible alacrity desperate to quench their thirst for wildlife protection had gathered at the fourth floor of Jain College, Palace Road for a common cause. Some were veterans with years of experience in the field eager to impart the knowledge gained through years of hard work and conservation while some were keen on absorbing it and the rest were getting started for a WILD INDIA and IT'S CHALLENGES. A workshop organized to introduce members and other enthusiasts to the nitty-gritty world of wildlife poaching in India were made well versed with "what's happening around us". 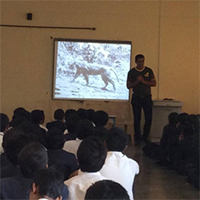 WILD INDIA and IT'S CHALLENGES saw Jose Louies, Assistant Manager - Enforcement, Assistance and Law at Wildlife Trust of India engross the anxious audience with real life experiences and the backdrops which come with it as an anti-poaching expert in the PELT division. Jose, who took a U-turn from his IT world to realize his dream of protecting wildlife gave useful tips with amazing insights into a world of wildlife trade that is so connected, established, modernized and twisted that the enforcement authorities find it difficult to tackle poaching and all the more important for conservationists to join hands to curb this nexus which is spiraling out of control. The disaster which is impending on our forests is man - made and man alone can control it before nature takes its course. The overwhelming experience brought the members together with an enforced zeal to fight harder and conserve better, thanks to the effort put in by Jose Louies. The workshop sent us back to our school days to remind us of an important fundamental duty: "to protect and improve the natural environment including forests, lakes, rivers and wild life, and to have compassion for living creatures"
A day as usual as any in the life of a conservationist... Try to conserve anything and everything possible found in nature... an everyday mantra for CATT! The lantana control management workshop, a place for an ideal conservationist saw many CATT members leaving behind their hectic schedules and heading out to Bandipur for a two day event organized to debate on what can be done about a serious issue engulfing our reserves. Produces chemicals that inhibit other plants from growing. Produces toxins which are poisonous to herbivores. Uprooting them simply exposes dormant seeds, increasing them in numbers. Produces around 12000 seeds which remain dormant up to 11 years. However, all is not lost due to the effort put in by the forest department along with CATT and other NGOs who have used a novel idea to put the malice to some good use. It is found that L.Camara can be used to make furniture with the help of tribal population spread across the forests. This seems to have caught up as a vocational occupation among the tribals and may finally bring in some good news to the Paleotropical Kingdom. The two day event was a success with CATT's mentor and IFS officer, Mr. Kantharaju H C and Mr. Girish Sampath from the Shola Trust giving some useful and first hand inputs on conservation of forests when it comes to invasive weeds. This was followed by some field activities where all CATT members (new and old) got a chance to bond and experience life in Bandipur along with the Tribals. In short, it was a perfect bonhomie... with respect to conservation of course. 26 Members & Non Members of CATT Team did come forward and donated for the cause. APC or Antipoaching Camps are adobe of our foot soldiers. They live in these camp days together to protect our natural heritage. Instead of using firewood from forest now they will have LPG to cook food & live a better life. CATT Members & Volunteers have joined hand and donated 9 set of Gas Stove & Cylinder to 9 APCs of Antharasanthe & DB Kuppe ranges. We are committed to raise fund and complete other 18 APCs by year end 2016.